It's been three years since I first picked up my #1 bass. Not sure what took me so long to gush about it, but here goes! It is fairly well-established fact that the Fender Precision Bass is the most ubiquitous bass guitar on the planet. It's really no surprise why - the P-Bass is the perfect marriage of the Stratocaster's spage-age looks and comfort and the Telecaster's no-frills construction. This is also the reason it took me so long to warm up to it. If you've read my other articles, you know that my search to find the right guitar/bass has always been an attempt to make really quirky, odd instruments work as if they were their well-established (read: boring) cousins. Try as I may, though, a Guild Starfire is not a P-Bass. a Rickenbacker 4003 is not a P-Bass. A Gibson Thunderbird is not a P-Bass. Only a P-Bass has that versatile tone that comfortably slips into any type of music, and does so while boasting an instantly-familiar feel and balance. I got my P-Bass - a Fender Road Worn model - three years ago this week, on December 30th, 2011. The idea of owning a Precision was already firmly planted - I had been getting heavily into Bruce Thomas' absolutely brilliant playing and tone on all those early Elvis Costello and The Attractions, not to mention always digging James Jamerson's P-Bass wizardry. Plus, I wasn't happy with the basses I was playing; my main bass was a Classic Stingray which I had been playing for two years. It looked gorgeous and had super low action, but it weighed a ton and had an absolutely pathetic D/G string volume, an issue which I simply could not solve. My Road Worn P-Bass on the day I bought it (12/2011) and today (1/2015). On the Talkbass forum one day, I stumbled upon a thread whereupon the virtues of the Road Worn bass series (which includes a P-Bass and a Jazz Bass) were being almost unanimously extolled by the notoriously picky posters there. I was not aware that these basses were so beloved and instantly got to looking for a used one. As luck would have it, there happened to be one on craigslist in Brooklyn. I drove there and bought it that very day. I played it at my gig that very night, and it has not missed a gig since (thats 152 gigs across 5 states). I've only modded it minimally since then; the most notable non-cosmetic mod would be the DiMarzio Model P pickups (an original set from the mid 1970's). Though I quite liked the stock pickup, I needed something a bit more aggressive for my band. I dropped these DiMarzios in about 4 months after I bought the bass, and have had zero desire to change them since. They are just perfect for what i do (I love the vintage cream covers too). Though some might turn their nose up at this bass for being made in Mexico, it is easily better than the majority of the USA Fender P's I've played, and certainly all of the vintage 70's ones I've owned and played. It is ridiculously lightweight, making it the ideal foil for my band's long gigs. The body is extremely resonant, the tone is punchy and warm, and the neck is very stable, requiring only occasional tweaking (unlike my VERY needy Stingray). As is evident in the photos, I take great pleasure in playing this bass very hard. The nitrocellouse finish gives way quite easily to night after night of my drunken, heavy-handed picking. The missing finish behind the second fret on the back of the neck is a nod to Bruce Thomas, and a great aid on dark stages! Though I am now an ex-smoker, the cigarette burns in the headstock are a reminder of the outdoor gigs. 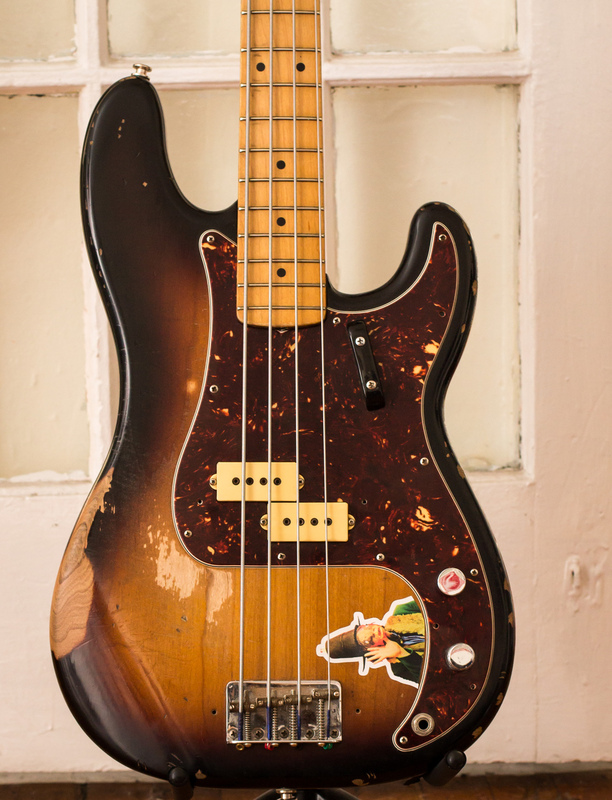 Plus, ya gotta love the Captain Beefheart sticker, which has been on the bass almost as log as I've owned it (the Coast Guard sticker is a small homage to my Dad). Quite simply: it is my workhorse, my constant companion, and without question the best bass I've ever owned.